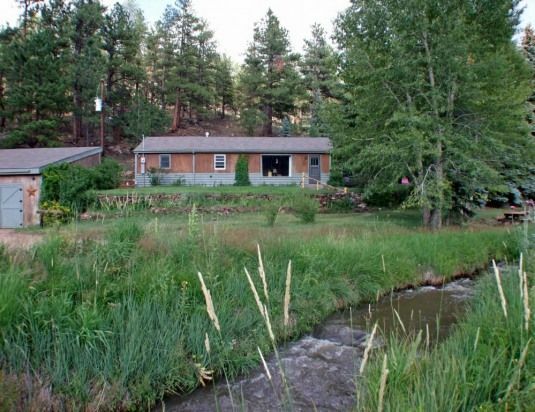 Our cabin is 2200 sq ft., located 14 miles north of Woodland Park in Westcreek, across the road from Pike National Forest. Westcreek is an old mining town with loads of history. Creekside Cabin is nestled among 60 year old giant pines and cottonwoods, on 40 beautiful acres, with groupings of rock formations. An old rock fort for the kids.. A large rock fire pit, and smaller fire place outside the hot tub room. As one of our guests stated, 'It is soothing to soul,' and it is!! The sounds of Westcreek bubbling past the front of the cabin will simply wash away all the stresses that can accumulate with everyday life. There is quiet solitude with sounds of nature all around. There is an abundance of furry friends...and hummingbirds galore. We now have 3 red tail hawk, 3 Golden Eagle and 2 Bald Eagle that hunt our property. In the early morning or evening you will likely see our resident deer coming to drink from the creek, red fox, or blue heron on the water. One neighbor even spotted a Moose last Spring. Down by the creek enjoy a game of horseshoes, or a game of bolo golf aka ladder golf, some call it hillbilly golf. The cabin is newly renovated, with a large open floor plan. We do however try to limit our guests to 8 for the comfort of all. The master bedroom is large with private bath, TV, a wood fireplace in the center of the room, and a reading area looking out to the pine covered hillside. There is nothing more relaxing at the end of your day than a soak in the private hot tub, looking out to the stars and sipping a glass of our complimentary Colorado wine. If you're lucky it will be a full moon and you can use nature to light the room with a soft romantic glow. Lots of games and puzzles. We are close enough to everything, yet far enough to be away from it all....Pay us a visit, you won't regret it, in fact once you're here you'll never want to leave!! The location is perfect. Just off Hwy 67 on a well maintained county road. However you are away from everything. Our guests have described it as 'A Little Piece of Heaven'. Another called it 'Soothing to the Soul' There are so many things to do within a short distance for those who are active. We have some who barely leave the cabin, just content to soak up nature. Kids love the creek and the stone fort on the hill. Not to mention several tree swings around the property. It has something for everyone, even our furry members of the family. Both bathrooms have been remodeled and are very cute. Master bedroom bath has tub and shower, main bath has a shower. Beautiful Westcreek runs in front of the property. There is an awesome Beaver pond at the opposite end of the property. There are fish in the creek. Land Line. Internet for wireless connection. We have electric heat in each room, as well as a gas fireplace in the kitchen area. All sheets, pillows and case, lighter weight cotton blankets, and comforters. Duvet covers for cooler nights. Full size washer in the laundry room. Nice large tile folding table. Laundry soap etc is furnished. Full size dryer in the laundry room. There is a beautiful stone fireplace in the master bedroom. Don't worry about packing wood, we will make sure you have enough for your stay! Large parking area in front of property. There is a one car garage. It will take a car, or a few ATV's. Internet is available throughout your stay also for wi-fi calling. All towels provided for bath as well as hot tub towels. Robes also provided for the hot tub. We do have high speed wireless internet. Spacious open living room with large wall mounted flat screen TV. Full size Refrigerator, with freezer. Full size stove with self cleaning oven. Standard 12 cup coffee maker. Plates, bowls, large glasses, coffee mugs, all eating utensils. The kitchen sink has a view to the hills. It is fully equipped for all your needs and easy to navigate. The dining room furniture is original. Jim and Deb refinished the wood and recovered cushions. The table is 10 feet long with 8 chairs. A great place to gather for meals, games or just visiting. We have two flat screen TV's - 1 smaller 26' in Master bedroom and one 32' large in Living room. Roku Box with Netflix. We have tons of games and puzzles. We do not have CD's however, Pandora is available on the Netflix ROKU device. We have children's games, coloring books, crayons, and colored pencils. We have DVD's for all tastes, action, romantic comedy, children. We have a private 8 person hot tub located in a seperate room next to the house. Robes and towels provided. We do not have air conditioning, however, there are ceiling fans in the main living area and master bedroom. We also provide box fans for the other two bedrooms. Westcreek runs through our property and past the front of the cabin, there are rock formations, a tree swing that swings out over the hillside. We offer horse accommodations if you'd like to bring your horses for quiet rides, and plenty of open pasture. Great cabin where my brothers and I called home for s long weekend. Large open dining room that flowed into the living room to keep the party together and the Master bedroom was on the far side of the home, like a room away from the rest of the house for privacy. This place is perfect for family, friends and lovers! If you want a way from it all, this is a great choice. Very peaceful with 2 fire pits. We had wonderful weather and viewed incredible stars!!! This was the perfect place for our family of 6 adults. We loved the firepit, hot tub and great eating space. Hosts were very helpful. Would love to return. Pleasant, comfortable location for family get together. Surrounded by beautiful scenery, this spacious cabin afforded our family get together with thoughtful extras. Seven of us had a wonderful time with plenty of room and a well supplied kitchen. We played games on the huge kitchen table and enjoyed the patio over looking the stream. The drinking water filtration system was greatly appreciated. They call this "mountain paradise" and I don't know what could be more accurate. I stayed here as part of a business trip in August of 2018. The house is immaculate, cozy, nicely furnished and really evokes the feel of a cabin in the woods. The view is remarkable and the hot tub, oh the hot tub! One thing I have to mention is the kitchen. I was cooking most of the time during my stay to save costs on eating out, and if you can imagine a kitchen utensil, it's there. I've been doing VRBO & Air-BNB type things for years, and I've never seen a kitchen with absolutely everything you need in it -- even spices! While you really get the feel you're "in the middle of nowhere" (meaning it's very peaceful, quiet and private), you're just a short drive to Garden of the Gods, Pikes Peak, Cave of the Winds and all that Colorado Springs has to offer. Don't forget to visit Sheep Nose and Thunder Butte while staying here. They are literally 5 minutes away. Our family loved the location and home! Nestled in the lower mountains with wonderful views, great pines, and hiking right out the backdoor. The home is comfortable, very well maintained, and stocked with pretty much anything one could want. The kids, ages: 11, 12, 14, enjoyed the outdoor activities: rock fort, hiking, creek, outdoor fire pit for making smores, tree swings, and of course, having good WiFi for evening XBOX Fortnite playing! The 15-minute drive into Woodland Park for supplies is visually pleasing and an easy one. Overall, we loved it and have talked about renting it again when we decide to visit the area again!